Having covered breaking news rather than sports for the past several months, I'm starting to see a tendency people have to attribute super powers to the media. Honestly, our superpowers basically boil down to the fact that we work for a media outlet, so people with information tend to take our requests for that information more seriously, because they know we can write that they had nothing to say about a controversial issue if they don't tell us anything. That's all it is. They don't let me in on the inner workings of a crime investigation. I don't get to look at documents that the public can't see. I might get someone to go out on a limb and tell me something they're not supposed to, but that's ultimately up to them, not me. I can't make them. We in the media don't see events happen first-hand nearly ever. We're always dependent upon other people, with the same flaws as us, to try to paint a picture of what happened in any incident. I wrote one story in which I ended up being called a Trump-bashing leftist because of this and this alone -- I reported what the police said had happened, and when I asked other people closer to the story what had happened, they refused to tell me. And then they got angry that I didn't write their version of the story. The media does have power in that it has a voice and it tends to be taken seriously when it takes its role seriously and does the job properly. But reporters are just as limited as everyone else. So my question to all of you is -- when you read an article, do you assume the writer is telling you something he or she knows? Or do you notice how everything in the story is attributed to another person whose job it is to know? selling something, I assume they are selling something. half the time they just attribute to randoms too. The mainstream media are pretty much told what to write. That’s the bare bones of it all. veya_victaous wrote: selling something, I assume they are selling something. If you obtained your goals politically, religiously etc, you would then become a conservative to uphold those beliefs. How, no mattr how progressive people are, they will always reach a point of conservative. Based on their utopian point of view. Ben Mothafuckin' Reilly wrote: Having covered breaking news rather than sports for the past several months, I'm starting to see a tendency people have to attribute super powers to the media. It proves many has a bias, what it proves is you deny people the right to read an article in full. What does it matter if its posted in full? I will never agree with him on abortion and yet you ban his website. What does that say abiout you mate? So how about you actuactually learn from the experince of this story? Don't waste it moaning about when you get cast poorly. You may think you already did, but you didnt. Hearts and minds. Apply the love you have with Eddie, in how you look at a story. but I disagree, as a technocrat MY core belief it to constantly seek to make the system more effective and more efficient, and there is no end to that, every time something is achieved the system needs to be reassessed and opinions made about where it can be improved. Progress is unto itself the goal, I don't ever see a static utopia being real, life will always be seeking to evolve and move forward to the next thing. As what about those weak and less efficient? How would they fit in such a society? people are merely cogs in the system, living as best they can within the system. if you're 'socialist' the point of the system is to look after the people. Improving both the efficiency and effectiveness of the system means making it easier and better for people to live within. and there is no doubt that there is huge room for improvements in both the efficiency and effectiveness of the Western system when it comes to looking after the 'weaker' people. We have seen socialism many times in history and many times it has always come with authoritarianism and millions suffer. So as to my earlier point, to what end? So you claim to say what is efficient? To what end and to who? And how do you actually achieve that? Does it then mean again others will suffer for this? You say you support a view of a national wage, that people do not have to work? How then would anything get done? You have to then believe people would evolve to not want to help anyone and never work. Who is going to care for those sick, elderly, mentally ill ect? Its the very same philosophy, that has seen millions suffer slavery throughout history. That those enslaved have no right to their own lives. That they should be subservant to others. Sorry, but what actual purpose are you serving by such a view? So what is this make believe system you think exists? You do realise that clearly unintended. You are subconsciously endorsing all slavery throuout history, by such beliefs? we are beholden to the system already. Automation, we really don't need humans to do that much. It's just giving people what they want. people want to live under a super powerful benevolent force, it's why they invent gods and venerate leaders. The system will eventually evolve to be that because that is what people want. Just as the bureaucratic system is evolving into a technocratic one, eventually more faith will be put in impartial and incorruptible AI than individual humans. When I read a newspaper article I presume the person who wrote it has researched the facts then put his own spin on it. People are turning away from religion, which makes your views redundent on this mate. Can nobody here actually believe that most journalists spend their time on the clock searching for stories that they think people will want to read, researching them as well as possible on a deadline, and writing them as objectively as possible? Because that's what I do every time I go to work, and that's what everyone I know who works in journalism does, too. Ben Mothafuckin' Reilly wrote: Can nobody here actually believe that most journalists spend their time on the clock searching for stories that they think people will want to read, researching them as well as possible on a deadline, and writing them as objectively as possible? and that is what your cog does But everyone puts their own spin on it, particularly in politics.. for every cog turning your way there is a cog a Fox turning the other. Modern Advertising goes as far to Present it's self as News along side Real News, this means to the public there is nothing to differentiate Your piece, from a Paid for Puff piece that gets printed as part of advertising package deal. News Media's 'Legitimacy' is a Victim of the success of it's own Business model. do you obey the laws? will there be consequences if you don't? do you accept the value of little metal discs and piece of paper (PLUS a bunch of digital data) in every transaction you make? Do those transactions with 'items' that have no intrinsic value (may not even exist our side of a computer) give you food, water, Housing, clothing, in fact ALL but your emotional needs? I have faith in Humanity to be what Humanity IS, not what your Snowflake Utopian nonsense wants it to pretend it is. I am also the only one looking at the future, not the current, Your Utopian ideal is based in the current and so is already obsolete, a step backwards from where we will be by the time it could be realized. it is you that doesn't accept the rate of technological progress and it's inevitable integration into our societies systems. Well I believe it, because it is what I myself practised throughout all my years in journalism, starting as a cub reporter who had the words of that the legendary Manchester Guardian editor C P Scott drummed into him from the first day in the office: "Comment is free, but facts are sacred." 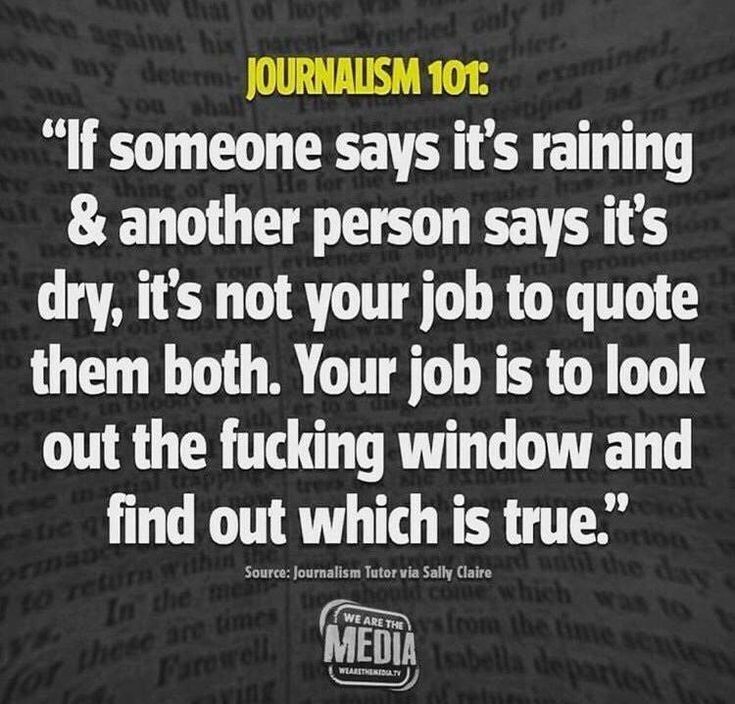 In my experience most of the accusations of bias against, in particular, UK national newspapers (substantially by Left wingers against the Daily Mail and by Right wingers against The Guardian) that appear in forums such as this where specific issues are discussed are based on an understandable failure fully to appreciate the differences in the roles of the reporter, whose job is to report facts and is expected to present both sides of an issue, even if one party declines to give it, and that of the columnist, who is frequently a freelance contributor, author or commentator and is paid to express his or her own opinions on matters of interest under their own name. A newspaper's own and only "voice" is its editorial or leader column, where the editor or a designated senior journalist comments on matters of current interest and importance. That particular aspect of the newspaper's content is fully entitled to be biased - because it will be in compliance with the paper's declared editorial policy, which in the case of the Daily Mail is to support the Conservative and Unionist Party and in the case of the Guardian to support the Labour and Co-operative Parties. And, frankly, if you don't like it, it is pretty pointless whingeing and hand-wringing about it to others: Just don't buy or read the bloody paper in the first place. Ben wrote: We in the media don't see events happen first-hand nearly ever. We're always dependent upon other people, with the same flaws as us, to try to paint a picture of what happened in any incident. You're looking at the news gathering side of the business. You can't write copy until something happens, true. But the newsman's art is in the framing of the story. That, you have a lot of control over. It used to be that the news framing of the story was the institutional view...the mayor said, the Constitution says, the book says... We still do a lot of that, but then, as in education, the practitioners began to look at what was actually happening. In academia, the Government discipline became political science, etc. Likewise, reporters became investigative journalists. The mantra became: what's really going on here, as opposed to the well-worn answer? Soon after, it was no longer ABC, CBS and NBC...but cable news, then the Internet, and social media, all starving for content...which meant new viewpoints. Media became real life, and indeed we split into left and right, Fox News vs. MSNBC, etc. It's been a revolution...and quite a ride for those of us in the business. The change in mechanics, on the heels of the change in perspective, has left us spinning...still spinning. So you may see only the news gathering part, but if you were to look at what you are doing existentially, you would see that you are framing the world. That said, it's all right. We need fresh, and indeed all viewpoints. What we don't need are false viewpoints. There is a big difference between different views and fake stories. Recently, and particularly with Trump, there have been those who resent the fresh perspective, and in retaliation (my theory) they push further, to invent news. Breitbart comes to mind. So, there's a new art on the horizon--perhaps something that we will have to teach in schools someday--that of distinguishing between falsity and truth, and building a wall between that and merely fresh perspectives. If you read a good story about Trump in one of your favourite media sources, would you believe it? You judge by the reputation of your sources, and any corroborating evidence. For example, many people, including former intelligence officer Malcom Nance, make the claim that Trump is afraid of Putin. When the world saw them together, and people saw Trump so subservient and unable to address an act of war by Putin the American experts say certainly happened, the corroborating evidence is rather conclusive. Lo...Bob's your uncle! It works in reverse too. Trump, for years, claimed that Obama was not born in the US. When he was never able to produce evidence of the fact, he lost a great deal of credibility. Eventually, he came to be known for his lies. Another way to tell the truth is, await the consequences. Someone might scream on Fifth Avenue that China has launched a nuke toward the US. Wait a little bit, and if you hear a big boom or feel a shock wave, you know. Of course, by that time it might be too late, and that's the drawback in that method. That's why you believe in real, live clues. Your belief system simply parrots life. We learn by impressions: we trip and fall, and it hurts; then we intuit that to jump off a cliff will result in similar, or worse consequences. We listen to an expert and what he says comes true; he becomes a reliable source. Don't count out simple observation and intuition. Nature made a more complex machine of you than you know. Okay. Thanks. But can you answer with a yes or a no? eddie wrote: Okay. Thanks. But can you answer with a yes or a no? Only if you clarify the question. My question was in the post you quoted? Nevertheless, it needs clarifying. It's too broad as it stands. Well give a broad answer then? Come on Quill, stop flaffing around. Here's a tip for your side. Ask a 'yes/no' question only when it's a factual matter: is the light switch on? Yes or no. If you incorporate any opinion or impressionistic stuff, you can't ask a 'yes-no' question. They can always say, can you clarify? Which I did. I can answer with a yes or no. If somebody I respected and trusted - an author, journalist, media source - told a good story about someone I didn’t think was good I’d believe it, because I believe in them and always have, I trust them, right? It’s an easy question and you don’t answer because you can’t answer without having to rethink your whole belief system. It’s why you waffle instead of answering clearly. eddie wrote: I can answer with a yes or no. If, if, if...see what I mean? You start out by stating qualifications. It's easy once you've swept aside all considerations and made the decision. But that rarely happens when it's a complex question, and someone else is asking. OK. Yes or no...are you going to have another baby? It’s hard to get a clear view if your windows have bars. so the Media encourage the rise of Nazis that put the media behind bars. 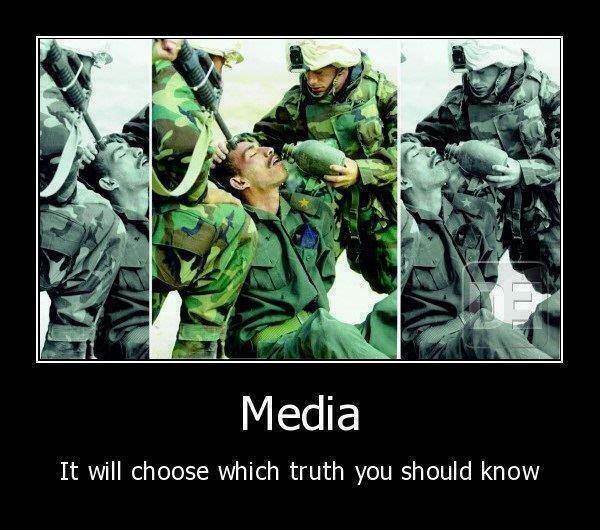 opinions are NOT equal, but the media presents them that way. they put the expert Scientists opinions as Equal to the Mummy blogger that didn't pass high school science. opinions are like belly buttons every one has them and they are not good for anything.